My 10 Favourite ESL/EFL Resource Websites | So, You Think You Can Teach ESL? Here’s a great list of helpful websites! Cristina’s blog offers a vast array of resources including listening tasks, discussion topics, grammar and vocabulary exercises, various lesson plans and many other activities. A group of teachers create video-based lessons mostly for adult learners but I’ve used their lessons with my teenage students with no problem. Conversation questions, ice breakers, role plays, lesson plans. Lesson plans on various topics, grammar activities, quizzes and more. ESL news lessons, mini lessons, skill builders. Very useful and creative teaching materials and ideas. I guess everyone knows this one. Most of the resources are available only through a paid subscription, but there are also many free lesson plans and activities. 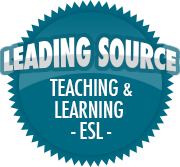 Another well-known website with plenty of English teaching resources which include kids, teens and adults. They also offer training courses and resources for teacher development.